Anyone who went to the University of Wisconsin or has taken a seat at the UW Memorial Union Terrace knows about the iconic sunburst chairs. The sunburst chair image is so much a part of the UW Memorial Union that they use is as their logo. The die used for making sunburst chairs is owned by the Memorial Union Building Association, which is why you don't see them on every patio in America. You can purchase sunburst chairs from the Union store, and only from the Union store, but only in Badger red or Winter Terrace white. The well-known John Deere green, Allis Chalmers orange and yellow are reserved for the UW Terrace — although they have been known to go missing and turn up in dorm rooms and on balconies in the area. Some of the sunburst chairs on the UW Terrace have arms and others don't. I haven't been able to find out any mention or reason for this variation — my uneducated guess is cost. At the time of its opening in 1928, the Terrace was populated with hickory chairs that quickly proved unable to tolerate Wisconsin weather. 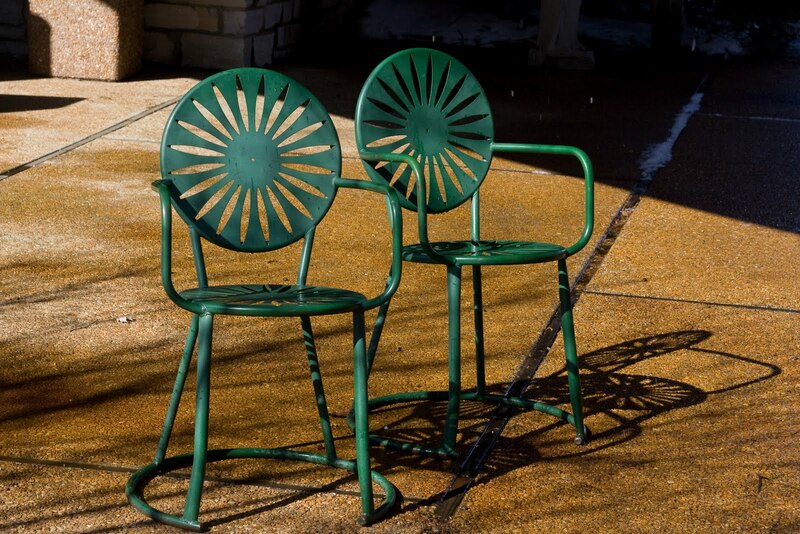 By the early 1930s, two versions of metal chairs replaced the wooden ones; one in an early version of the classic stamped-metal sunburst style, the other in this style known as the Deauville, where the sunburst shape was achieved with springy curved strips of steel. The Deauvilles, which by nature of their design were prone to catching water and consequently rusting, were phased out by the 1960s and relegated to the Union Theatre balcony. While a few other styles have been tried and failed, the stamped metal sunburst style, with a sturdy partial hoop bracing the legs at the bottom, remained the popular choice not only for its durability but its ability to stay relatively level on the uneven stones that pave the Terrace. The Deauville version of the Terrace chair is sometimes referred to as the “garbage can cover” chair and they're available nationally in a variety of colors. Wisco Industies is the sole maker of the UW Terrace chairs. It takes Wisco approximately two months to manufacture a batch of Terrace chairs. Wisco produces approximately 300 chairs a year, one batch around February and another later in the year. 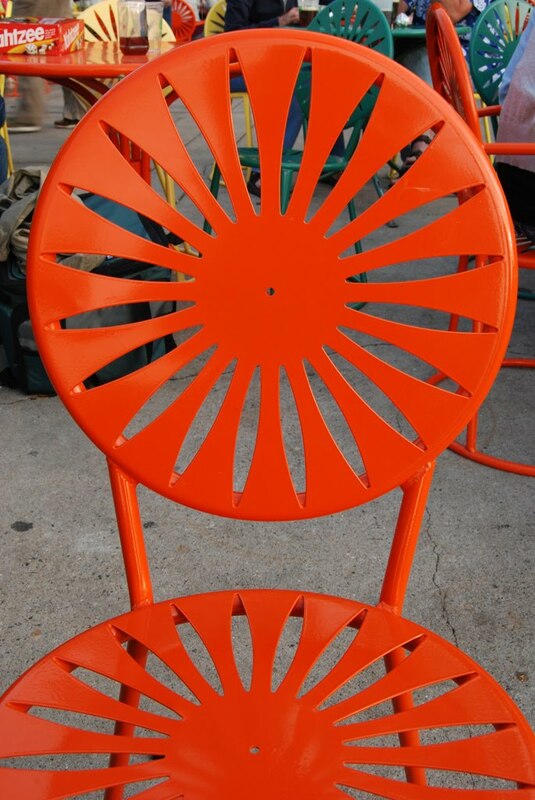 If you're looking for a mid-century patio chair, the sunburst chair is a great place to start. Very interesting. Love the chairs.